Cobimetinib (GDC-0973, RG7420) is a potent and highly selective MEK1 inhibitor with IC50 of 4.2 nM, showing more than 100-fold selectively for MEK1 over MEK2 and showed no significant inhibition when tested against a panel of more than 100 of serine-threonine and tyrosine kinases. Phase 3. Three types of selective inhibitors of MAPK signaling produce expected differential kinase inhibition and activation responses in HCT116 colorectal cancer cells. HCT116 cells were treated with 250 nM of GDC-0973, GDC-0623, SCH772984 or DMSO for 1, 4, or 24 h. In the washout samples, cells were drug treated for 24 h, then changed into fresh media and harvested after 0.5 or 2 h. Lysates were used for Western blots of total and phosphorylated MEK, ERK, and RSK; blotting for COX IV was used as the loading control. Mol Cell Proteomics, 2017, 16(2):265-277. Cobimetinib (GDC-0973, RG7420) purchased from Selleck. Western blots showing protein changes of p21, p53, cyclin D1, and cyclin E in HCT116 cells after treatment with 1 μM cobimetinib over different timespans. Cell Physiol Biochem, 2018, 47(2):680-693. Cobimetinib (GDC-0973, RG7420) purchased from Selleck. Human-washed platelet aggregation was performed by optical aggregometry following stimulation with U46619 (0.25μM) in the presence or absence of LPS from E. coli O111:B4 (1μg/mL) after 3 min of incubation with Cobimetinib (100μM) before activation with U46619 (0.25μM) (B). PLoS One, 2017, 12(11):e0186981. Cobimetinib (GDC-0973, RG7420) purchased from Selleck. Hoeflich KP, et al. Cancer Res. 2012, 72(1), 210-219. Baudy AR, et al. EJNMMI Res. 2012, 2(1), 22. How to reconstitute the inhibitor for in vivo studies? S8041 can be dissolved in 5% DMSO/30% PEG 300/5% Tween 80/ddH2O at 5 mg/ml clearly and it is ok for both oral gavage and injection. GDC-0994 is a potent, orally available and highly selective ERK1/2 inhibitor with IC50 of 1.1 nM and 0.3 nM, respectively. Phase 1. Trametinib (GSK1120212) is a highly specific and potent MEK1/2 inhibitor with IC50 of 0.92 nM/1.8 nM in cell-free assays, no inhibition of the kinase activities of c-Raf, B-Raf, ERK1/2. Features:More potent than PD0325901 or AZD6244. PD0325901 is a selective and non ATP-competitive MEK inhibitor with IC50 of 0.33 nM in cell-free assays, roughly 500-fold more potent than CI-1040 on phosphorylation of ERK1 and ERK2. Phase 2. Selumetinib (AZD6244) is a potent, highly selective MEK inhibitor with IC50 of 14 nM for MEK1 and Kd value of 530 nM for MEK2. 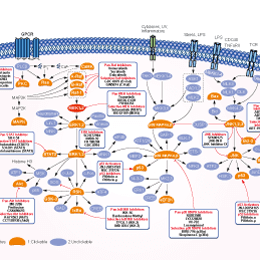 It also inhibits ERK1/2 phosphorylation with IC50 of 10 nM, no inhibition to p38α, MKK6, EGFR, ErbB2, ERK2, B-Raf, etc. Phase 3. Features:First MEK inhibitor being tested in Phase II clinical trials. U0126-EtOH is a highly selective inhibitor of MEK1/2 with IC50 of 0.07 μM/0.06 μM in cell-free assays, 100-fold higher affinity for ΔN3-S218E/S222D MEK than PD98059. 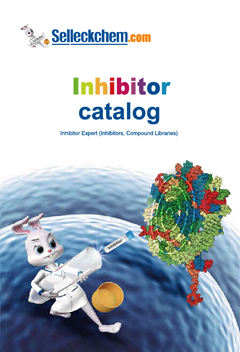 Features:A chemically synthesized and highly selective inhibitor of both MEK1 and MEK2. PD98059 is a non-ATP competitive MEK inhibitor with IC50 of 2 μM in a cell-free assay, specifically inhibits MEK-1-mediated activation of MAPK; does not directly inhibit ERK1 or ERK2. Features:Does not inhibit c-Raf phosphorylated MEK1. Features:First MEK inhibitor to begin clinical development. Binimetinib (MEK162, ARRY-162, ARRY-438162) is a potent inhibitor of MEK1/2 with IC50 of 12 nM in a cell-free assay. Phase 3.